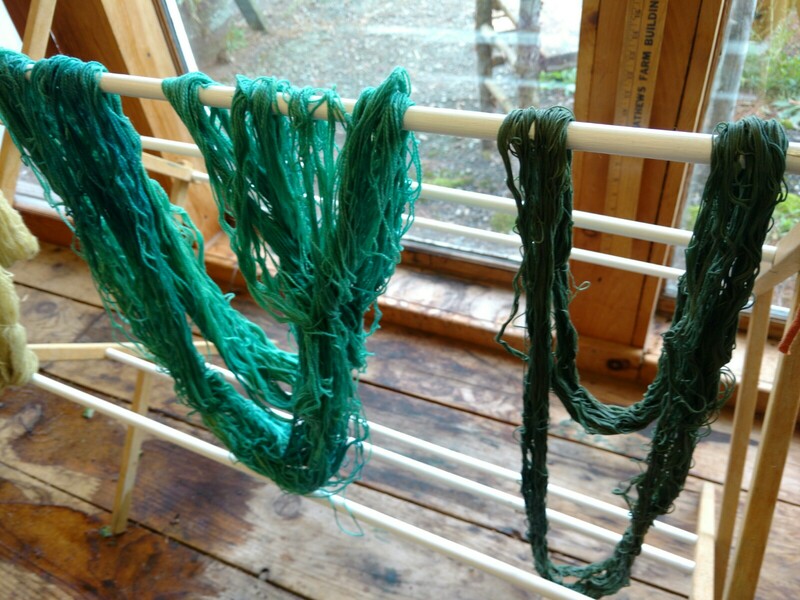 Having never taken organic chemistry, dyeing with plants I grow or gather is often instructive, sometimes bewildering, and always a bit magical. 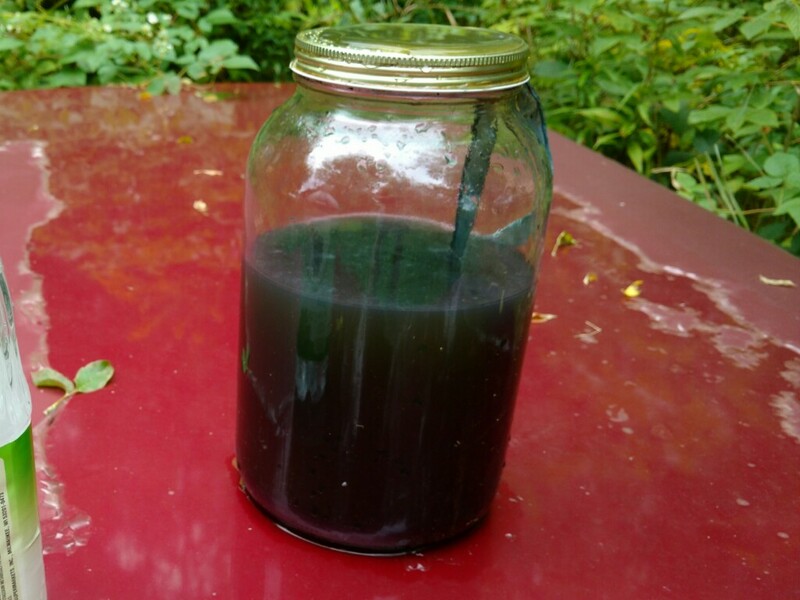 My recent experiments with homegrown Japanese indigo and invasive buckthorn have been all of above. 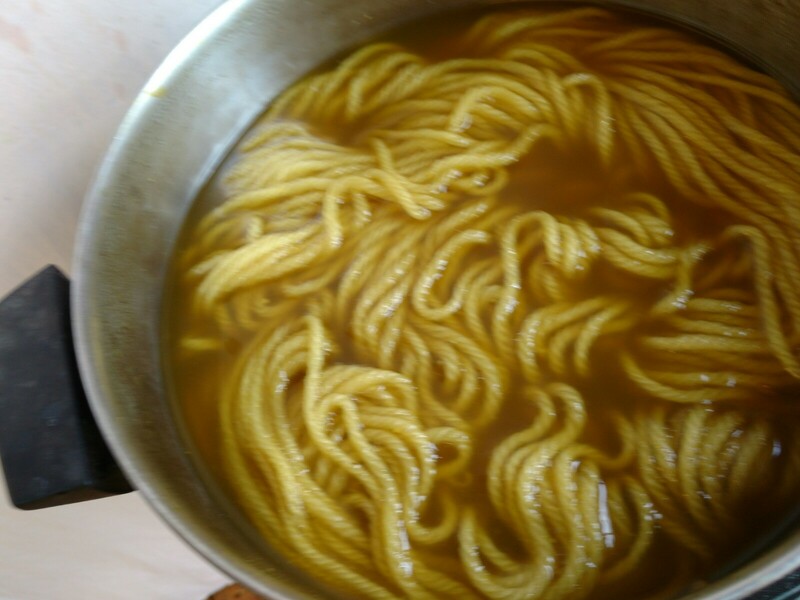 This week I started working out how to dye with fresh leaf Japanese indigo without a chemical reduction agent. Thiox is certainly quick and reliable in the fresh-leaf process, but my goal is to minimize the chemical vapors in my airspace. For my first experiment, I tried a guesstimated variation on the popular 1-2-3 indigo vat that uses powdered natural indigo instead of fresh leaves. I was guessing on the amount of pickling lime to use and got the vat more alkaline than it needed to be. 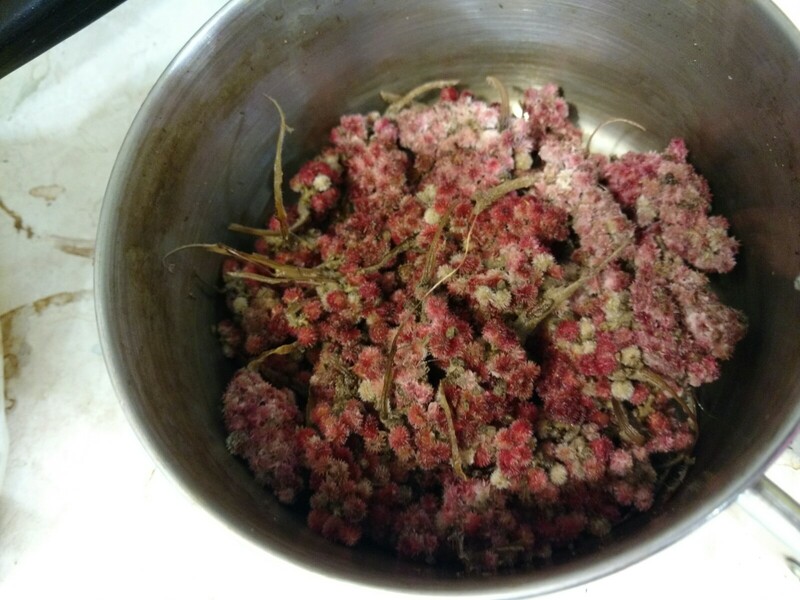 Since sumac bobs were handy, I simmered a few to extract an acid to bring down that pH. 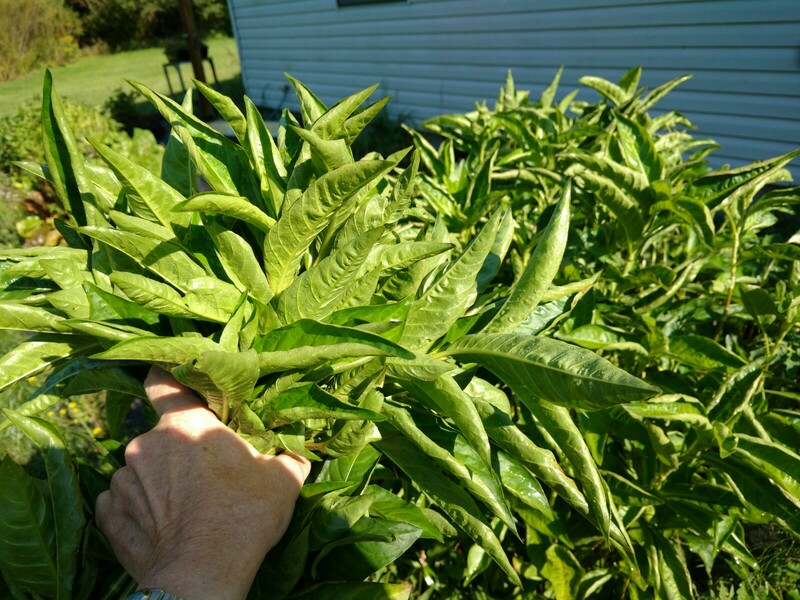 I’m also thinking that staghorn sumac is rich in antioxidants and I’m trying to reduce the oxygen in the solution… Well, that’s a guess, too. Next I’ll try a fermentation vat with fresh leaves. But in the meantime, I have a fermentation vat in the works using natural indigo I purchased. I ground the cake between two rocks and put the powder into a small cloth bag with a long ribbon tail. Stop here if you’re squeamish. The bag went into a jar of stale urine. In the traditional “sig” or “chamber lye” vat, urine provides both the alkali needed and the natural sugar to feed the vat and reduce the oxygen. 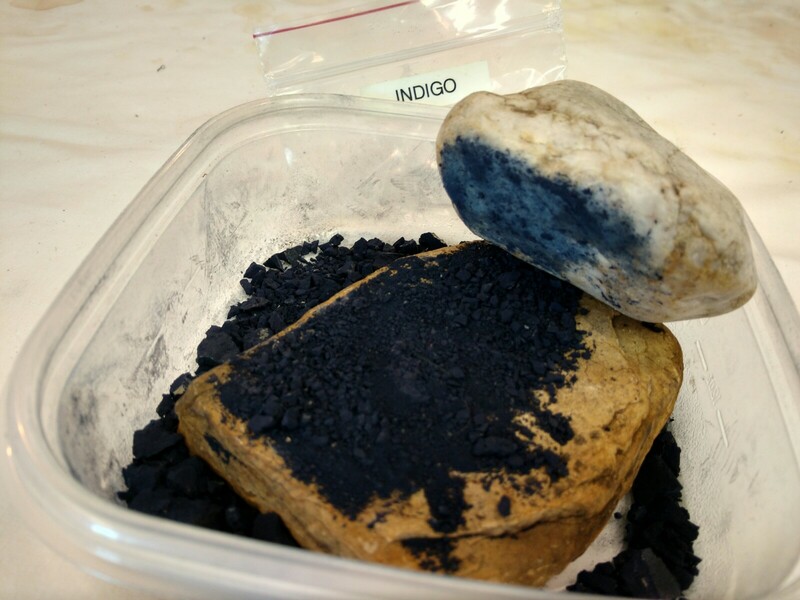 Twice a day I massage the bag to help dissolve the indigo powder and get it into the solution. We had some cool days this week, which I think slowed down the fermentation. But the vat still smells right, I think. I was raised in a dairy barnyard and have peed in many outhouses, so this smell is not knocking me back on my heels. Still, I expect the smell to get stronger next week when I move it to a warmer spot. 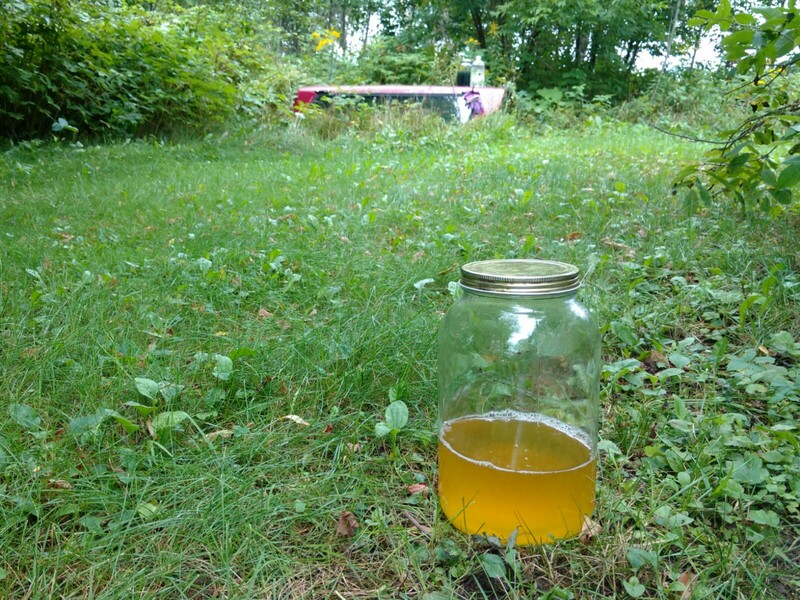 That jar of pee in the foreground is what we’ve been collecting to soak yarn in before it goes into the vat. I kind of expect the vat to be about that same color when it’s ready to dye. The last fermentation experiment of the week was buckthorn bark in an alkaline extraction. Jenny Dean included this technique in A History of Colour. 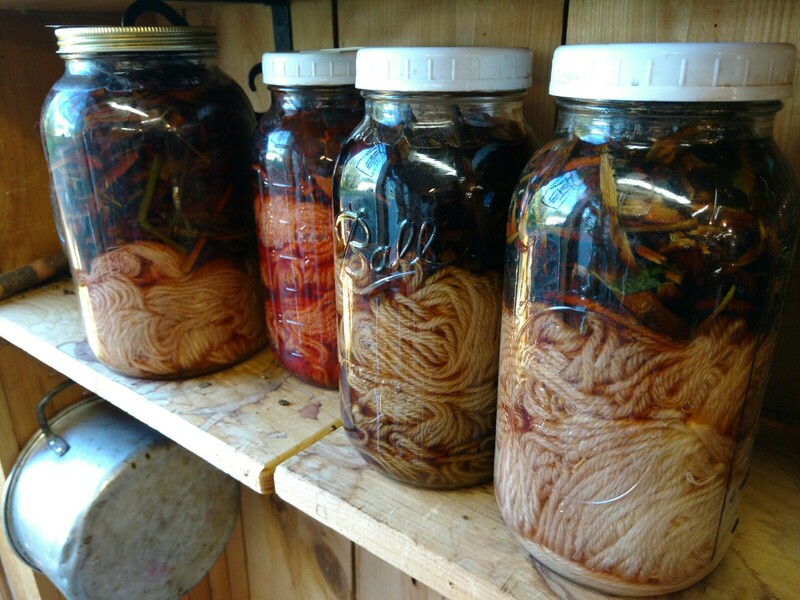 I’m eager to see if this jar (on the far right) will produce a colorfast red on wool without the application of heat. 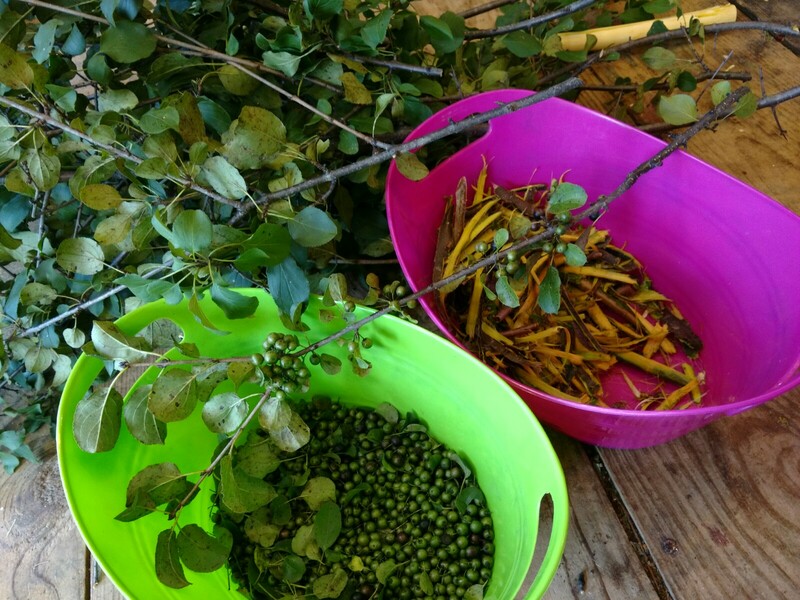 Buckthorn is an invasive species where I live. 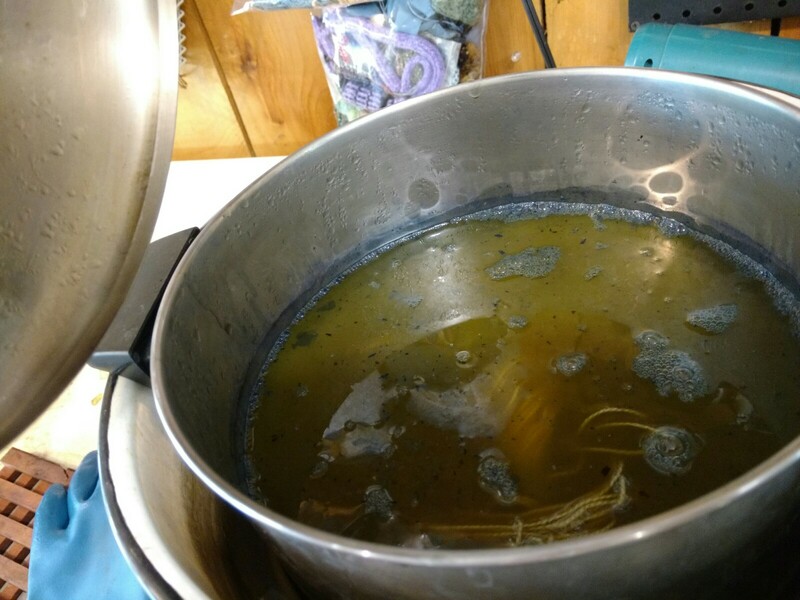 So while I was harvesting bark I brewed up a dyepot from the green berries. It’s a good yellow. And those berries, at least, won’t find their way into the digestive tracts of birds that disperse the seeds to increase the problem of this alien’s rampant growth. Donna-do those berries turn blue when ripe? If so, I dyed with them and got a nice shade of green. They do turn a dark blue when ripe, Kim. I experimented with dried ripe berries once before, and there’s definitely color potential. The part that still makes me nervous about dying with the berries is whether the seeds might still be viable afterwards. And if I don’t use the berries, how to dispose of them so I’m not just sowing more invasives. At least after I strip the bark I think it won’t be sprouting!